Review: Roger Ackroyd was a wealthy, powerful man in a small town. His lover was suspected of poisoning her abusive first husband and she eventually committed suicide. Before she died, she wrote Roger a letter expressing her guilt and saying she was being blackmailed. Before he could name the blackmailer, Roger was stabbed in the neck. With Hastings off on his honeymoon, Poirot is aided by the local doctor, Dr. Sheppard (our narrator), to help track down the killer and figure out the mystery. Widely considered Christie's best novel, she was almost kicked out of the Detection Club* for this book. 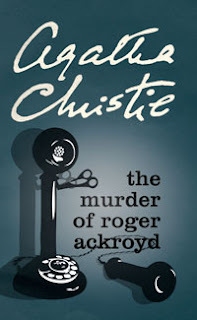 With a lively cast of characters (including Dr. Sheppard's know-it-all spinster sister, the pre-cursor to Ms. Marple, another successful series) including Roger's poor sister-in-law, his adoptive son with financial problems, his scheming butler and several other suspects, this was a fabulous read. I thoroughly taken in by the story and did not suspect the killer at all. Excellent book! In addition to meeting for dinners and helping each other with technical aspects in their individual writings, the members of the club agreed to adhere to a code of ethics in their writing to give the reader a fair chance at guessing the guilty party.